Practice l ink.com F A ll 2018 7 EMPLOYER INFORMATION 9 Company Index Where to find the organizations featured in this issue. 11 Specialty Index Search for employers recruiting your specialty. 12 Employer Index A directory of employers featured in this issue— organized by location. Index includes the page number, contact information, website and codes for the specialties being actively recruited. 56 See this issue's physicians in exclusive video interviews at Facebook.com/ PracticeLink t Afshin Khaiser, M.D. PHOTO BY SETH MORRIS 86 FEATURES 46 What physicians make (and why) Nothing looms quite as large for your future as negotiating the best compensation package possible. 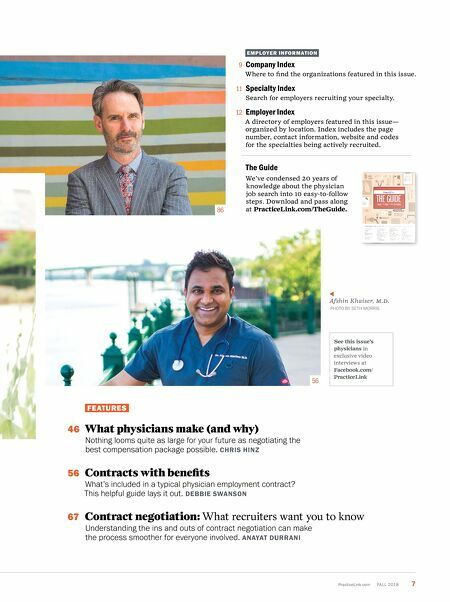 CHRIS HINZ 56 Contracts with benefits What's included in a typical physician employment contract? This helpful guide lays it out. 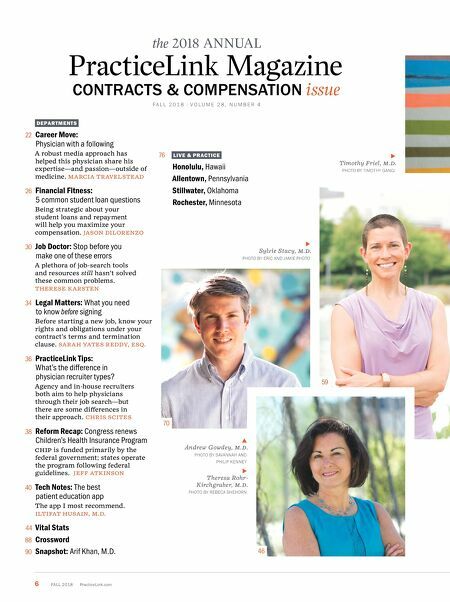 DEBBIE SWANSON 67 Contract negotiation: What recruiters want you to know Understanding the ins and outs of contract negotiation can make the process smoother for everyone involved. ANAYAT DURRANI The Guide We've condensed 20 years of knowledge about the physician job search into 10 easy-to-follow steps. Download and pass along at PracticeLink.com/TheGuide.